Most people hear the word honeysuckle and they think of either the invasive tartarian honeysuckle that takes over our forest lands or the flowering vine. The genus Lonicera is quite large however, and contains a number of excellent garden plants. One such plant is our native mountain fly honeysuckle, Lonicera villosa. This is a shrubby boreal species found in moist areas in the northern US and ranging north through the Canadian arctic. This northern range makes it very hardy, certainly to zone 3 and probably through zone 2 depending on the provenance of the seed. The strain I'm growing is from here in Wisconsin. Despite being found almost exclusively in wet areas like stream banks, marshes, bogs, and fens; this species is actually pretty adaptable and is doing just fine in my shaded garden with average moisture. It does appreciate some direct sun and extra water during drought. Organic rich soil is also appreciated. Growth on my plant has been moderate to slow. It can reach up to 5 feet tall and wide. Currently after a number of years my plant is about 2 feet tall. I imagine with a little more sun and moisture it would be faster growing, but it seems happy enough growing in the same conditions as my shade plants. I grow it with Rhododendron, Hosta, Polygonatum, and Solidago flexicaulis 'Variegata'. L. villosa has a much more refined texture than the weedy L. tatarica. The twigs are finely textured and leaves are fairly small and bright green. In fall the leaves turn a nice clear yellow. It isn't as bright as other yellow fall colors in the garden, but it is fairly clean and a good blend with other fall colors in the shade garden. Blooming begins in May as the plant begins to leaf out, the flowers are small, white, and very lightly scented. Bees love the flowers. I imagine butterflies and hummingbirds would also like the flowers, though it blooms a bit too early here for either of them. In late-June to mid-July blue-black fruits are formed. They are edible and supposedly somewhat tasty. L. villosa is closely related to L. caerulea, which is currently gaining more attention for its edible fruits and is being marketed as honeyberry. The fruits are said to taste similar, and I can attest to honeyberry being quite good and similar to blueberry in flavor. While my L. villosa did set fruit this year, I didn't think to try it. I let the birds, who are quite fond of the fruit, have it. Despite all of this plant's great attributes it's almost completely ignored for gardens. It's nearly impossible to find in the trade, even from native plant specialty nurseries. While it certainly isn't as showy as a Hydrangea or Rhododendron, it is very worthy of garden space. The early spring flowers are lovely and it's an excellent food plant for wildlife. It's easy to grow and not terribly fussy. We occasionally offer a few in the shop when we take the time to root some cuttings or grow some seed. Give it a try sometime! Compared to grasses for sunny gardens, the selection of shade-tolerant grasses is fairly limited. But there are some great grass-like plants that really broaden the range of fine-textured accent plants for woodland conditions. 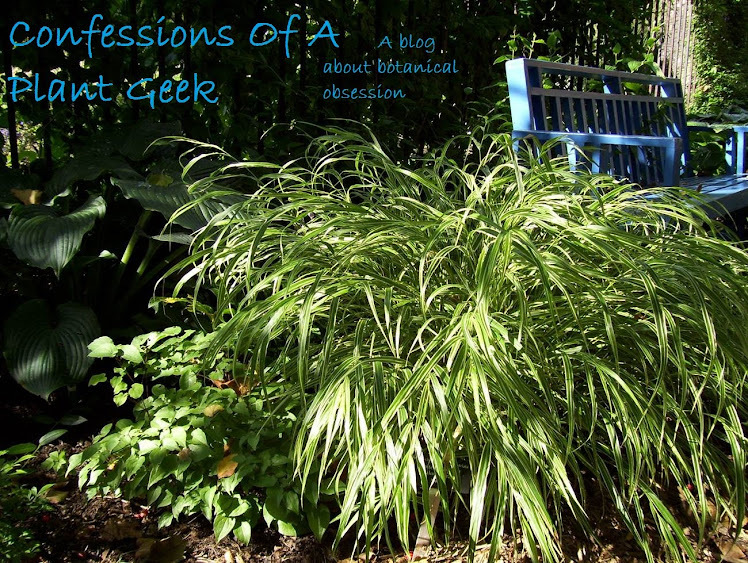 One group of grass-like plants are the sedges of the genus Carex. One of my favorites in the genus is Carex muskingumensis, or palm sedge. Palm sedge gets its name from the alternating whorls of leaves which resemble miniature palm trees. Native to the midwest ranging through Ontario south to Arkansas and Oklahoma, palm sedge is found in wooded wetland areas such as marshes, sedge meadows, and river banks. It tends to be very hardy, USDA zones (2)3-9 and like many wetland plants it is fairly adaptable to a wide range of conditions. While you can certainly grow it as a marginal aquatic in a pond, it is equally suited to average garden conditions as long as it receives some irrigation during hot and dry summer months. There are a few varieties available on the market, one of the best is 'Oehme'. This variegated mutation was found by the late Wolfgang Oehme. Emerging bright green in spring, the foliage quickly darkens to a medium green; except for the margins which turn a nice clear yellow. This variety typically grows between 12" and 20" tall and 24" wide, though in fertile moist conditions it could grow larger. With age it forms a dense mound of foliage. 'Oehme' has a medium-fine texture and blends well with broad-leaved plants like Hosta, Salvia koyamae, Heuchera, and Rodgersia. A great combo would be a few Heuchera 'Dark Secret' or 'Stainless Steel' in front of 'Oehme'; behind that a large dark Hosta like 'Empress Wu' with Phlox stolonifera 'Sherwood Purple' creeping throughout to fill space and offer flower color. I've had 'Oehme' in the garden for a few years and it's done a good job impressing me, but I've never taken any great pictures of it for some reason. It's been moved a couple of times and after being divided a bit this season it's settling into a new spot quite well.